This year the Hammer organized Radical Women: Latin American Art, 1960-1985, a monumental exhibition curated by Cecilia Fajardo-Hill and Andrea Giunta. With 120 artists and over 250 individual objects, the project—a result of nearly eight years of critical academic research—has certainly emerged as one of the most important to come out of the Getty’s Pacific Standard Time: LA/LA initiative. Of course, any museum worker will tell you that an exhibition’s true lasting power lies in its ability to be both timely and timeless, and Radical Women undoubtedly achieves this. Examining and attacking the deep histories of censorship, racism, misogyny, and political oppression prevalent in the artists’ countries, it’s no wonder that the show found a special place with all of our visitors. In a year so marked by the creative power of women’s collective action against violence and intolerance, Radical Women emerged as an exhibition that speaks as much to our contemporary moment as it does to a specific history in Latin America and the US. We were lucky enough to have over 40 artists with us for the opening week festivities, which was no small feat for a group spread out across 15 different countries. Many had never even met each other! Between the 1960s and 1980s, they had faced torture, imprisonment, and censorship for creating the kind of work they did. Being able to celebrate and share space with them for the few days we could was absolutely unforgettable. We kicked things off with a bang at our opening celebration with live music by Jungle Fire and Chulita Vinyl Club, and with thousands of visitors lining out the door to get a first glance at the exhibition. I had never seen the museum so packed. We also had performances by Regina Silveira (the art cookies!) and Martha Araújo throughout the night. The opening weekend was full of amazing performances, with Mónica Mayer and Cecilia Vicuña topping off the days-long celebration. Mónica’s El tendedero was a five-day project—part performance, installation, and workshop—in which dozens of student volunteers walked through the museum and asked thousands of visitors to share their experiences of sexual assault. The notes were then hung on a pink clothesline near the Hammer Store. Cecilia Vicuña was just as interactive with the visitors, using her Doubled performance to contemplate intimacy and togetherness by literally weaving the audience together with wool. I especially loved this performance because it was the first time it was ever done publicly, having only been performed once in private with the artist and her partner. The Political Body in Latina and Latin American Art was an ambitious scholarly project which was livestreamed in both Spanish and English, a first for the Hammer. 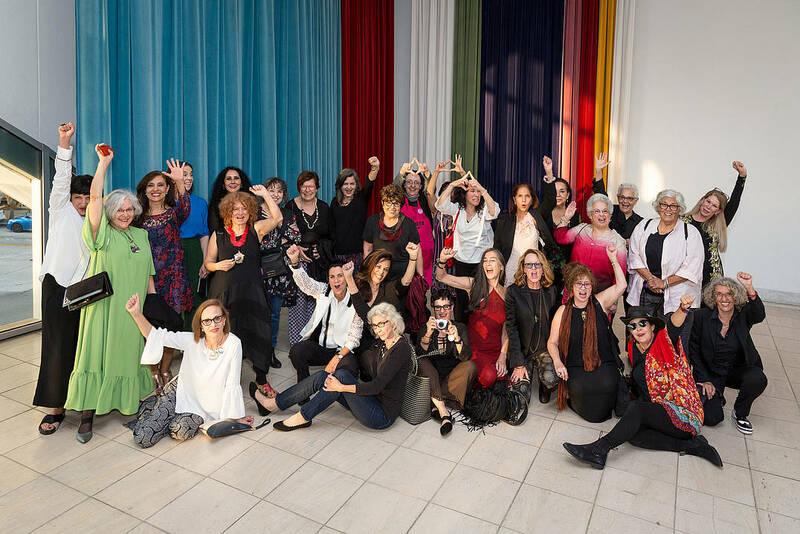 Artists, curators, and scholars from around the world convened at the Hammer to discuss the political female body, histories of radicality and feminism in Latin America and the United States, and the ways in which Radical Women artists contributed to the development of contemporary art. Afterwards, we partied (of course). The best of all, however, was seeing how deeply our visitors were able to connect with the exhibition. There were countless selfies with Judy Baca’s Las tres Marías, Sylvia Palacios Whitman’s Passing Through, and our awesome Radical Women merchandise. It was an opportunity for us to contemplate the value of engagement and how we can continue to bring meaningful programming to our public. Thank you for sharing these moments with us!